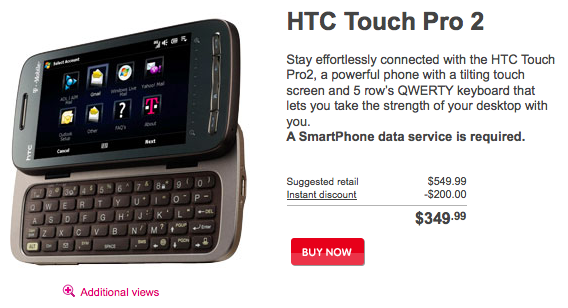 Yes, indeed, the day so many of you have been patiently waiting for has arrived as T-Mobile’s HTC Touch Pro2 is now on sale. 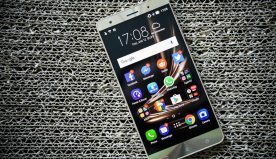 Arguably the greatest Windows Mobile handset to ever grace this great green earth, the Touch Pro2 features a 3.6-inch WVGA restive touchscreen display, sliding QWERTY keypad, 3.2 megapixel camera with auto focus, Wi-Fi, GPS, 512MB ROM/288MB RAM, microSDHC support and a 528MHz Qualcomm MSM7200A processor – all working to make this Windows Mobile 6.1 smartphone with TouchFLO 3D the gem that it is. The only problem as we see it is the 2-year price tag that could make even a hardened extortionist weep: $349.99. Then again, perhaps we’re being too hard on T-Mobile’s pricing; there are worse things you could be spending your hard earned money on, right?